After the Moto E4 and Moto E4 Plus of last year (both released as attractive cheap smartphones), Lenovo and Motorola Mobility are now seemingly planning to introduce a Moto E5 family. 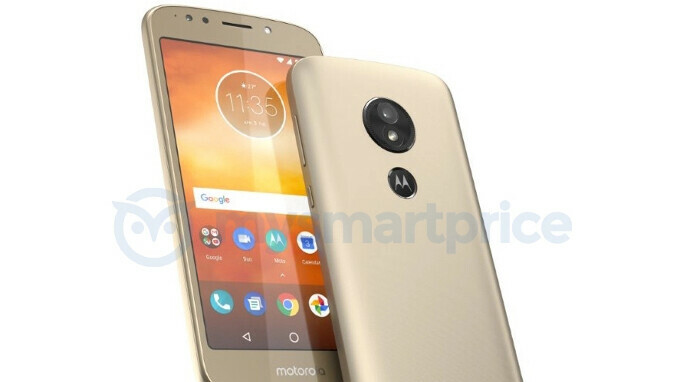 While official details about this are currently missing, a render that allegedly shows a Moto E5 was just revealed by Indian website MySmartPrice. Unlike the Moto E4 and E4 Plus, which - similar to all recent Moto handsets - feature fingerprint scanners embedded on the front, the Moto E5 comes with a rear fingerprint scanner. The scanner is embedded into the Moto logo, just below the main camera. In case you're wondering, the Moto E5 is not the first Motorola smartphone with a rear fingerprint scanner. This title belongs to the Motorola Atrix, which, in 2011, became the world's first Android handset to feature a fingerprint sensor (this was two years before Apple launched its first iPhone with TouchID). Relocated fingerprint sensor aside, the Moto E5 looks a lot like the Moto E4, and it even has a similar front-facing LED flash to accompany its selfie camera. For now, details about most of the new phone's features are missing, but we're certainly expecting this to be a fairly low-end (and affordable) device. The Moto E5 could be officially announced as soon as April, and we're assuming it will be sold both unlocked, and via some carriers in the US. First of all your an iPhone user. I have seen other posts from you. So your statement where your tired of FPS on the back, certainly doesn't hold water. Especially when it's much faster than even iPhones or other smartphones that have a FPS in the front. When you pull a smartphone out of your pocket, purse, napsack, or bag. Your hand is already holding the smartphone at the back. Since your fingers happen to be attached to your hand, then that means your fingers are already on the back of the smartphone as well. At least my fingers are attached to my hand are automatically at the back of the smartphone. So will you look at that. Besides this is a low end Moto E series smartphone. It will be around $100. Also it has smart Lock so you can use you face to unlock it as well. Or if you have a Android Wear smart watch or any smart watch for that matter, then you can use that to unlock it as well. This inexpensive smartphone gives you more options than an iPhone X. When it's on the back I don't use my thumb. I use my index finger which is easy to find with a quick touch. Especially when it's in the middle of the phone anyway. You make it sound like it's so difficult to find the back fps, especially if it's positioned in the middle of the back. My finger finds it very quickly. It's muscle memory now. I don't even think about it. Plus if it's in the front of the phone then it's at the bottom of the phone. I have used both as well. However when the FPS is on the front, you said it yourself your thumb is there. Yet after you touch the FPS with your thumb, then you have to shift your hand to hold the phone after you unlocked your smartphone with your thumb. If it's on the back, you don't have to move a thing, or readjust your hand after you login in. Besides all that, this is an inexpensive smartphone. Did you forget about that point? Or are you choosing to ignore that point? What do you want an understanding the screen FPS? Also this smartphone since it's running a pretty much stock Android, then it has smart Lock as well. So you can use your face, or smart watch to unlock it as well. It's a low end phone, its not gonna have everything. Probably costs less to continue using micro USB. Even the G5S Plus has microUSB. And that costs almost twice as much as E4 Plus. Nothing surprising here. hope they are preparing for bezel less next G, X and Z series :) and I'm happy to see "motorola" logo instead "moto"
Oh yeah, they're making Motorola name alive again. Didn't notice that.